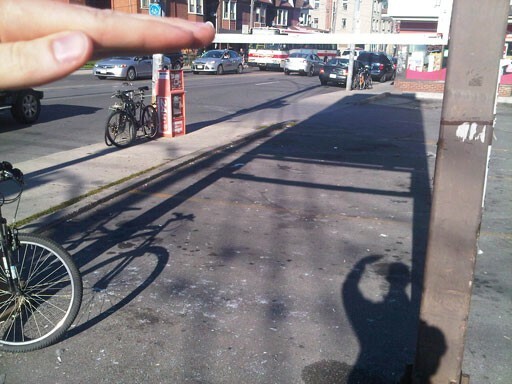 I was in a small accident today on my bike. I say small because the only visible signs of it are a little finger-nail sized cut between my eyes and a bit of bruising (photos below). I look like I was punched in the face by someone wearing a ring on their middle finger. I was riding my bike earlier today, on my way to the gym for a 12:30pm pilates class. I stopped at a light and a women asked me if I knew where a particular street was. I told her yes, and gave her some directions, and then continued on. It was at the next intersection where I had to turn and head east. 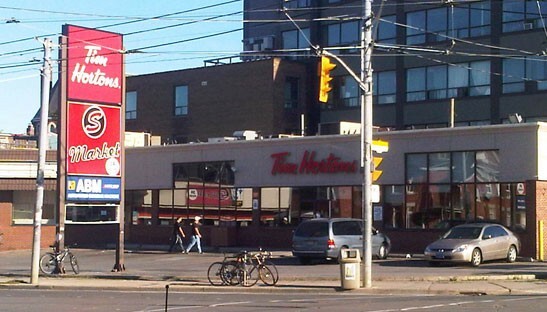 It is a small complex with a convenience store and a coffee shop. I usually bike through the parking lot rather than going around the curb at the lights because it’s generally safer to dodge traffic that way. This time, there was a vehicle in the normal route of passage, and being an impatient person (first mistake! ), I decided to go around the car. This involved going under a tall sign. As I approached it, coasting forward at a not-too-fast pace, I noticed glass on the concrete beneath the sign. I’ve had a lot of run-ins with flat tires on my bike this year, so I’m pretty wary whenever I see shiny bits on the road ahead. I should have just been patient and waited/gone around. Unfortunately, I was so fixated on the glass and not running over any big chunks, that I hadn’t been paying attention to the bottom edge of the empty sign bracket I was attempting to pass under. And I paid for it. 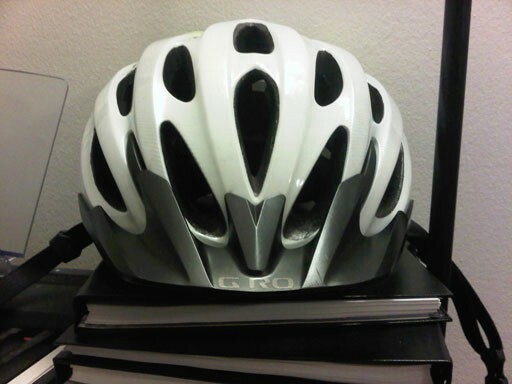 My head was tilted down and forward, and my bike helmet was sticking up and back at roughly a 45 degree angle. The sign bracket caught my helmet and following the laws of physics, pulled my head and neck backwards as my bike and body moved forward beneath. I happen to have probably an abnormally strong neck. Chalk that up to have long hair and combing it in the shower which involves tilting my head backwards and holding it like that while pulling my head back and down for a couple of minutes. This impact completely surprised me (I hadn’t been expecting it at all) and so my neck got pulled back but then popped forward again like a spring. The impact knocked my helmet and hat askew (but not off), and broke the arm of my sunglasses (the piece that broke off was still embedded in my hair as I discovered when I got home), but I didn’t fall off my bike. I rolled to a stop on my own terms. I was completely shocked and dumbfounded immediately after I realized what had happened. An older man walked over and asked me if I was alright (I didn’t actually get knocked off my bike, hence why I attribute a strong neck that absorbed the impact) and I told him “yes, I think so, I’m just in shock”. He said he hadn’t even seen what happened he’d just heard it and turned around. Needless to say, I didn’t go to pilates. But I did remember an errand I had planned to run, a block away from that very spot, on the way back from pilates, and so I decided to at least go do that while I was up there. cut and bruise. I didn’t impact face first either. crazy. What did I do when I got home? Well, aside from trying to find some glue to fix my sunglasses… you guessed it, I hopped on facebook and posted about what happened, because that’s what people do these days. Even me. No, I’m not proud of myself. I replied “I feel fine, a little stiff necked, but that’s to be expected. No headache or anything”. Then my dear mother jumped in and echoed the sentiments. I replied that I didn’t want to be stuck sitting in a hospital waiting room for 6+ hours. (my experience in past with going to a hospital with non-serious injuries is a minimum 3 hour wait). I ultimately made the decision to go to a walk in clinic instead (which still ultimately ended up taking me 3 hours, including travel time). The doctor checked my neck and got me to do some physical coordination tests but said I seemed fine. He said to take it easy for at least 3 days, no running, cycling or pilates. Have a light dinner tonight. Ice your head. He was surprised to hear I hadn’t been knocked off my bike. That made his prognosis much more positive. He even said I might not have a concussion. about 4 hours after the incident/after seeing the doc. not looking as beat up. 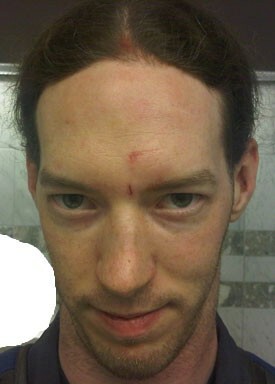 the bruising on my scalp is really evident here where my helmet got bonked into my skull. On my way back home I returned to ground zero, because I wanted to have a second look at this sign tower and how low the bottom edge was. I was surprised to confirm. I know I sit pretty high up on my bike, and the frame was actually at eye level for me standing up straight on my own two feet. hand held at my own eye level for reference (I’m 6'0"). you can see the glass I was watching for on the ground ahead. 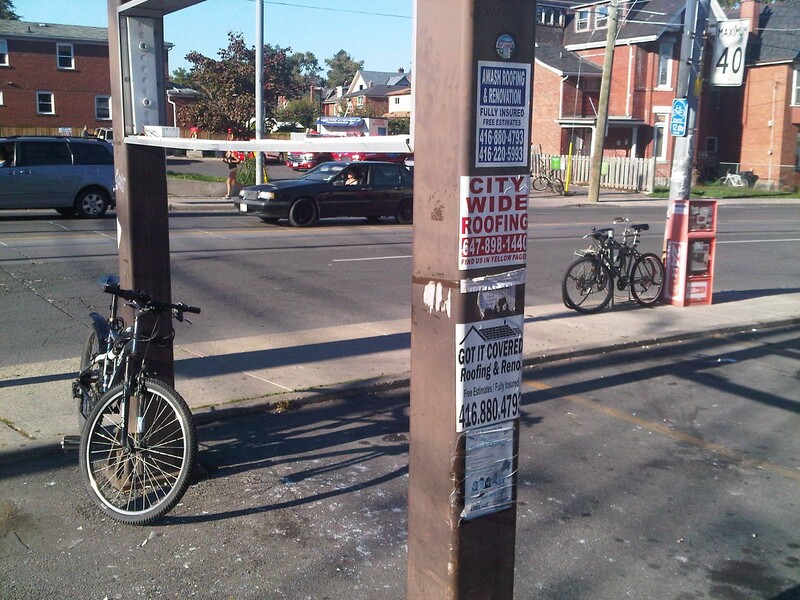 PS — no, that’s not my bike on the left. Then it hit me — if I had been going just a little bit faster, the impact might have snapped my head back so fast/hard that it’s entirely possible that I could have damaged or even broken my neck or spine. I could have been paralyzed, I could have even died. Just because I was too impatient to wait for a car to move, and because I got pre-occupied with worry about a flat tire rather than my also very fragile neck and spine. I remember back at my very first job when I was 16, we had a guy who worked the drive through who was in a wheelchair, and I asked him how it happened and he said he went off a jump on a dirt bike and lost control in mid-air and fell on his back and damaged it. And that was it. Paralyzed for life. He was really cool about it though, kudos to him. But I remember back to that, and, I remember how often I say “if I was ever immobilized, I think I would want to die”. I love being able to walk, to run, to swim, to ride my bike. I like playing sports on occasion. Heck, I even like climbing stairs (beats an elevator in my mind!). I came exceptionally close to robbing myself of one or both things that are very important to me today — mobility, and of course my actual life. I just happened to be going slowly enough to get lucky, and just teach myself a really valuable lesson. The doctor told me “ALWAYS wear a helmet. Even if you are only going 100 ft to a convenience store. You never know what can cause you to slip or fall and then it’s all over”. I will admit that I don’t always wear my helmet. 98% of the time, yes, but not 100%. And that 2% is no man’s land. I never want to play there again. Oh, and just for the record, the sign didn’t make contact with my skin. You see that cut and the bruise on my forehead? 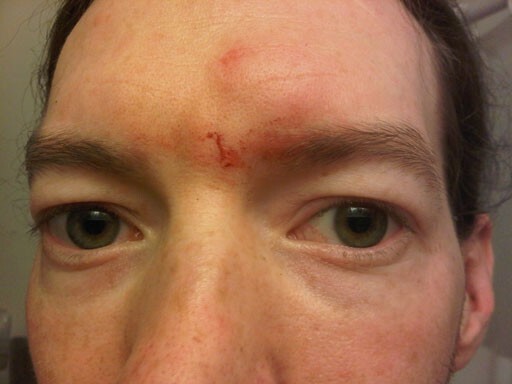 Yeah, that was from my helmet/hat/sunglasses being rammed into my face. My head was down. I was looking at the ground. I told you it looks like I got punched. I don’t even want to think of what kind of scalping I’d have gotten if not for my helmet. Wear a helmet folks, and don’t take stupid short cuts. And be aware. And really value your life and what you have. I’m lucky that mine wasn’t taken away from me today, but for how careless I was for a moment it could have been. And that perspective alone is worth so much to me.